Both the Women's and Men's Clubs held their joint annual dinner at Pembroke College on the 5th May, 2018. It was a fun-filled night in which we celebrated another successful season for the Blues and Panthers Women's teams. You can find photos of the evening on the CUWBbC Facebook Page. ​The Blues Women Basketballers closed out their 2017-18 season last Wednesday with another tight tussle with long-time rivals Worcester University. This was the final match for a number of long-time Blues players, Mie Monti, Herta Gatter, Claire Ratican and captain Leonie de Jonge, who are due to finish their studies this year so the team wanted to send them off with one more win to celebrate their successful university basketball careers. However, with farewells on the mind and a two-week break after Varsity, the Cambridge women were slow off the mark after the tip. Worcester dominated the first minutes of the match, jumping out to an early lead with a number of field goals coming from G. Brownell and A. Maledis which went unanswered by the Blues who, despite some good attempts, couldn’t get any of their shots to drop. After a timeout called by Cambridge coach, Amalio Fernadez Pacheco, to demand some intensity from his players, Becky Illingworth stepped up to the plate to create some energy for the Blues. Illingworth, known for her explosive drives to the basket, won a couple of free-throws off a foul and followed this soon afterwards with another short jump-shot off the drive. However, her efforts were answered by Worcester, who closed the first quarter with a three-pointer from C. Hinett. With a 4 vs 15 deficit to make up, Cambridge entered the second period knowing there was work to be done. Experienced point-guard Mie Monti stepped up her defensive pressure of Worcester’s ball handlers through the mid-court, forcing them to slow their transitional play while Ratican and de Jonge went to work on the inside in offence, knowing this was the way to lift their team and create some much-needed energy for the Blues. Ratican secured two points from the post followed immediately by a three from de Jonge. Ratican then had the chance to make a three-point play, scoring while being fouled along the baseline but failed to convert the single free-throw. Worcester seemed surprised by this rally and was kept relatively scoreless for the second quarter, until they recovered some composure in the 7th minute with V. Nhano and Brownell scoring back to back threes. Although the Blues won the quarter by two points, they still went to the main break behind Worcester 16 vs 25. ​Worcester returned to the court in the third with their usual volubility and intensity, sensing a comeback in the offing. Determined to quash it early, Worcester asserted themselves with an opening three-pointer from Brownell and a couple of penetrations from E. Maloney giving them another 7 points to dash Cambridge’s hopes. But the Blues, knowing the time of reckoning was imminent, stepped up their defensive intensity to halt Worcester’s advance and instigate their own offensive strategy. Coach Fernandez-Pacheco asked Blues ‘talls’ Ratican and Emily Lees to continue working away in the post, with de Jonge attacking from the free throw line. With these instructions, the Blues dominated the scoreboard in the last half of the period, holding off Worcester’s attack and finishing the quarter with a three-point play from captain de Jonge. Although the score-line was 27 vs 36 to Worcester, Cambridge could feel a change in the wind. In the final period, de Jonge came out with ferocity to score two baskets off the drive, bringing the deficit to only 5 points. Worcester tried to stop the Cambridge advance but was unable to do so, with Illingworth, Ratican and de Jonge continuing to push to the basket and only scoring three free-throws so far in the quarter. De Jonge levelled the score in the 8th minute with another three-point play off the foul which enlivened the Cambridge bench and spectators. Hinett did her best to help Worcester regain the lead with a three-pointer but Ratican countered this with another two-pointer post move to have the Blues chasing by one point. Cambridge needed a quick turnover for the chance to score again however their hopes were dashed when Hinett hit another three under defensive pressure. Coach Fernandez-Pacheco called a quick timeout to orchestrate one final play to regain the lead but the Blues women couldn’t get the ball through the hoop and were forced to foul to stop the clock. The Blues fate was sealed by Brownell and Hinett, who both scored a free-throw each to give Worcester the definitive win of 41 vs 47. At the end of the game, Captain de Jonge commented “It’s been a great journey. Whilst I really wanted to end on a win, I’m very proud of the team; the commitment we showed throughout the season really did pay off. I want to thank my teammates and our coaching staff for a very memorable year. Playing basketball has had such a positive effect on my physical and mental well-being, and I’m really going to miss it”. 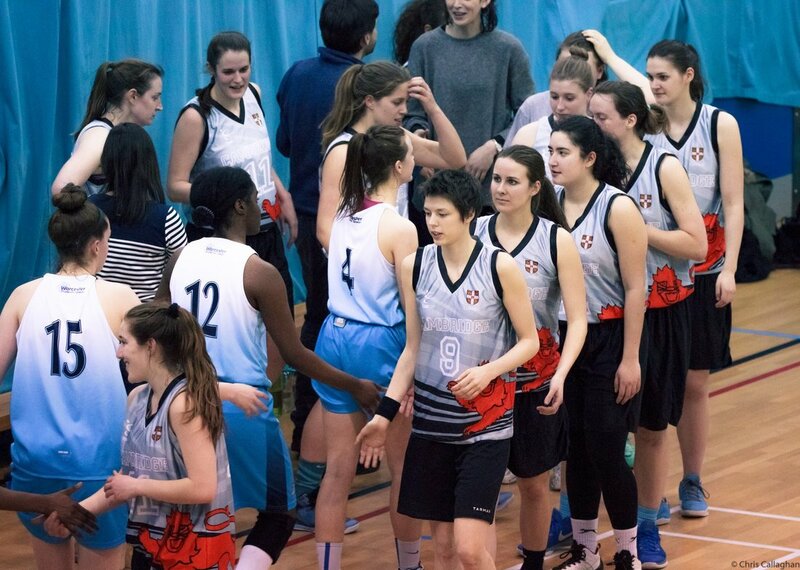 The Cambridge Women’s Basketball Club wish their leaving players all the best in the future and look forward to playing with them again in future alumni matches. Scorers: de Jonge 20; Ratican 9; Illingworth 6; Lees 4; Hicks 2. After a team huddle during half-time led by the Panthers Coach, Kent Griffith, the Panthers came back into the third quarter focused and determined. The team executed the plays well which caused the opponent to struggle in both their defensive and offensive plays. Forward Joanna Kurcharczak had a strong game presence and shot a game-high score of 11 points during the third quarter alone. Due to the Panther's tight defence throughout the third quarter, Cranfield failed to score a single shot and the third quarter ended with the Panthers leading with a strong 39-15. The Panthers continued to put up a strong fight throughout the final quarter with guard June Song dominating the court and scoring a total of 10 points. Cranfield managed to break through the Panther's tight defence and put up several baskets after 4 minutes into the last quarter. However, the Panthers picked up the pace during the final few minutes of the game and put up 8 points during the final 2 minutes. The game closed with a final score of 55-22. After a tough season in 2016-17, the Cambridge Panthers started off the new season with a strong 55-22 win over the University of Cranfield. The Panthers dominated the game from the very beginning, starting off with a man defence before taking the opponents off guard with a full court press 1 minute into the game. Despite our initial game tactics, Cranfield opened the score board with a 3-0 lead. The Panthers fought back hard with forward Joanna Kurcharczak making several good drives towards the basket, putting up 4 points while point guard Eunice Wong scored 6 points from mid-range jump shots. The beginning quarter ended with the Panthers leading 12-7. The second quarter saw the Panthers stumble as the team failed to execute several of the newly learnt game plays. Nonetheless, the Panthers made several good shots with captain Evita Widjaja and guards Gaia Ganzer and June Song contributing to the continuing lead of 24-15 by the end of the second quarter. The Panthers secure their first win of the season.